We are engaged in offering our prestigious clients a very premium quality range of Goods Lift. Rope hoist mounted on a supported i-beam, which lowers & raises the cage. In the absence of an RCC well inside the building, a fabricated enclosure supporting structure can be erected on site. This structure is independent of the building can be erected inside or outside the building, just touching. Guide wheels are fitted on the cage, which runs in the c-guides which are provided on the structure on opposite sides. This arrangement enables smooth & trouble free travel of the cage in a vertically straight line. Collapsible gates are provided at all entry and exit points for essential safety. Design: Compact dimensions, low weight, easy to operate and easy to maintain, modular design with direct fits between components. 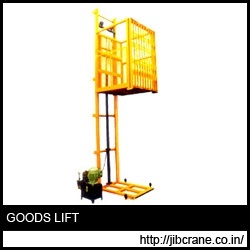 We are engaged in offering our prestigious clients a very premium quality range of Goods Lift.